While the US may have been the last major country to transition to EMV chip card technology, adoption has been swift - as has a corresponding rise in card-not-present (CNP) fraud, as fraudsters shift their focus to less protected channels such as the call center. Not surprisingly, according to Aite Group, an independent research firm, 72% of executives expect call center fraud loss to continue to grow, with $4 billion in counterfeit card fraud moving into the phone channel. 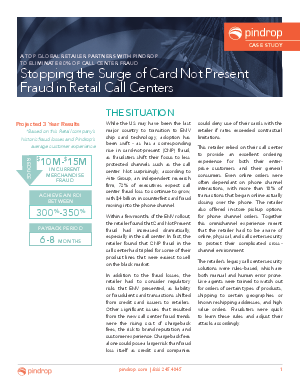 A top global retailer partners with Pindrop to eliminate 80% of call center fraud. Download this white paper to learn more.